In a low or no friction air bearing system, the response has a tendency to become unstable quickly, even with low gains. the same proportional gain and with some derivative gain following response is obtained. Large overshoot now is is eliminated. However, the overall response is also slower (meaning the time required to reach the target). As noted above, by just using a proportional term, a stable response can be obtained, however the final target is not reached. With added integral term, the longer the error exists, the larger the integral will become, resulting in a correction torque. 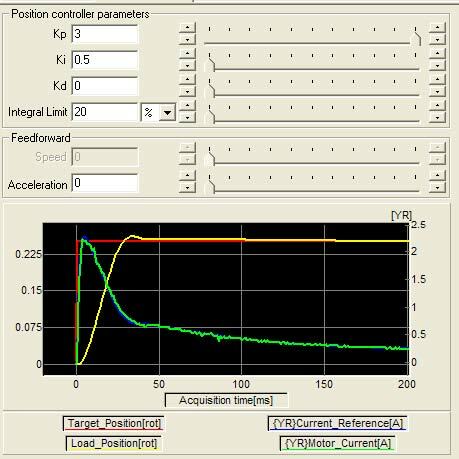 In the system above, with the same proportional gain, and with added integral gain, position error (steady state error) is reduced to zero, even in the presence of friction. Overshoot: by how much is the target position exceeded. Step response time: after how much time is 67% of the final target reached. Settling time: after how much time is the position settled within some % of the target. - Saturation: one can run into current, torque or voltage limitation, which creates a strong nonlinearity typically resulting in overshoot and instability. - Resonance: as the system gets excited at higher frequencies and power, system resonance may affect system response in unpredictable ways. - Jitter: higher gains will cause small changes in the feedback to cause large jumps in currents. This leads to jitter (small oscillations at standstill). The current limit in our system is reached at 4A. Reaching this limit causes saturation and an ensuing oscillation (which does die out after coming out of saturation). 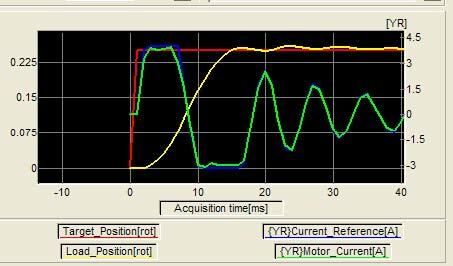 This means that motor and drive sizing should not only be based on the torque and speed requirements, but also on the required system response. Mechanical transmission components should also be carefully selected to avoid system resonance (see previous article on the effect of coupling stiffness). Lastly the feedback resolution should not just be based on positioning resolution requirements but also on desired system response. Servo loop tuning is not a trivial task. Hands on experience is invaluable and above information will, hopefully, allow to achieve the desired response. Although the behavior of the PID algorithm is well understood, there are many implementation details and system parameters that influence the response. By utilizing a systematic approach of increasing the proper gains gradually while monitoring the response, stable behavior can be more quickly obtained. 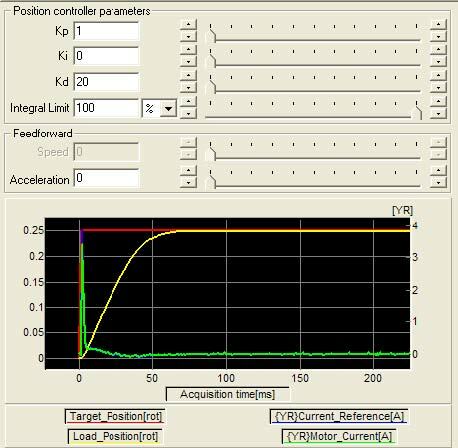 In parallel, one should also observe current and torque to determine how much power is applied, or to avoid saturation. If the system is marginally sized, it may be necessary to adjust performance expectations. IntelLiDrives manufactures linear actuators, XY tables and rotary tables for the industry, government, science and research institutions around the world for applications in medical devices, life sciences, semiconductor and electronic assembly manufacturing, research and development and other industries, requiring high precision and throughput motion control solutions.